Ornithological Science publishes reviews, original articles, short communications and comments covering all aspects of ornithology. Manuscripts are judged on the basis of their contribution of original data and ideas or interpretation. All articles are peer-reviewed by at least two researchers expert in the field of the submitted paper. Manuscript are edited where necessary for clarify and economy. 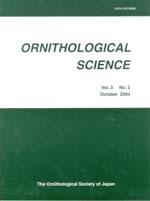 Ornithological Science aims to publish as rapidly as is consistent with the requirements of peer-review and normal publishing constraints. Printed by Letterpress Co., Ltd.